Credit to image used in pin goes to Guard Your Health. – Changes were made to the original image. Practicing portion control is one of the most effective ways to lose weight. The serving sizes of whatever food you eat plays an important role in your fitness goals. By knowing just how much is too much, it can lead you to a healthy weight. 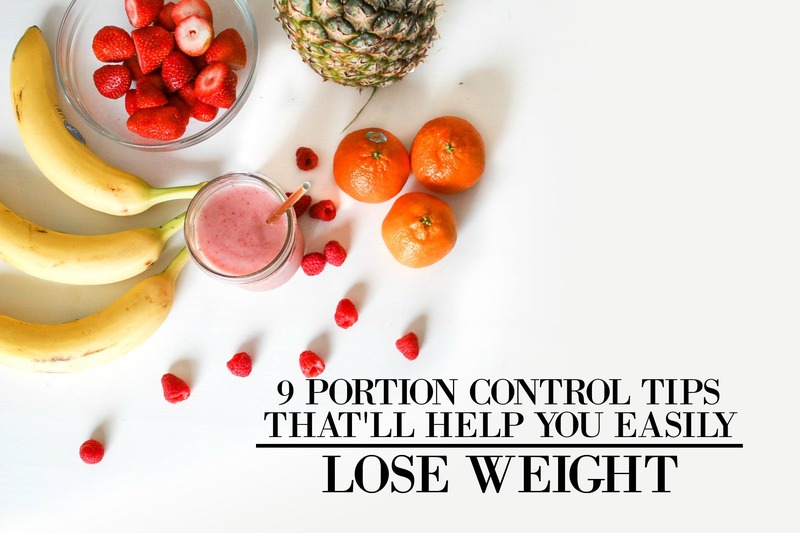 And having said that, I’ve curated a list down below of some fail-proof portion control tips and tricks that’ll keep you on track for a healthier lifestyle. These are ideas that will help you understand portions, lose weight, and make your life a bit easier. So check the post out, and let me know what you think! Given that high fiber foods are great appetite suppressants, filling your plate with these kind of foods will make you feel fuller longer. Meaning, you’ll avoid sweet, salty, and calorie-packed cravings. Try adding fiber-rich food like fruits, beans, vegetables, nuts, and seeds. They taste great and are definitely better for your health. Your palm is a great way to figure out your portion sizes. The size of your fist will be for your vegetable serving. A cupped hand will be how many carbs you can have. And your meat portion will the the size of your palm. Make it a habit to measure your portions this ways and you’ll have your eating under control. When plating your meal, make sure to fill half of your plate with veggies first. Increasing your veggie portion will automatically decrease the portion sizes of carbs and fatty food, giving you a more healthy option. One of the easiest ways to control your eating is by trying this trick. It takes 20 minutes for your stomach to send signals to your brain that you’re full. So by slowly eating, you give your body time to realize that you’ve had enough before you overeat. Plus, if you eat slowly, you’ll enjoy the meal more, the people you’re with, and the ambiance of the setting. So try to slow down and have fun. You don’t need to make things complicated when it comes to portion control. There are plenty of tasty meal plan ideas that just require basic ingredients and will fill you up right away. Stockpile your pantry with essentials and healthy food and you won’t be tempted to cheat. Before you open a bag of chips or box of chocolates that contain 10 servings (for example), divide the content into 10 smaller baggies ahead of time. This will make you mindful of how much you’ve already consumed and also prevent you from overeating. When possible, drink a glass of water before each meal. Filling your stomach with water will naturally make you less likely to overeat and suppress your appetite. This will help you feel fuller faster and avoid unhealthy cravings. Try using salad plates for your meals! When your brain sees your small plate is full, it’ll assume that you have just the right amount, even though you’re consuming less. Super easy right? Instead of getting pie, ice cream, and other sweet tooth desserts, try eating some fresh fruit. They’re low calorie sweet-tooth satisfiers. You can make them into smoothies or eat them as is. They taste yummy and give you tons of vitamins. Portion control doesn’t mean you have to eat tiny portions of everything. Just by learning how much is too much will keep you on track to your fitness goal. And implementing these nine tips will help you get fit and stay healthy. So give them a try and let me know what you think!